Historians examine artifacts, objects humans made, that give us an insight into life in the past and into our lives today. They explore the ways our lives are the same as our ancestors and ways our lives have changed. 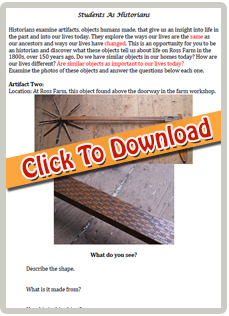 This is an opportunity for students to be an historian and discover what these objects tell us about life on Ross Farm in the 1800s, over 150 years ago. Do we have similar objects in our homes today? How are our lives different? 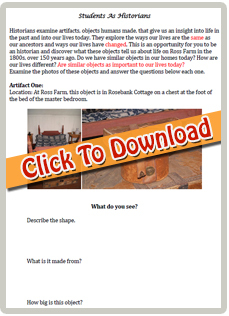 Are similar objects as important to our lives today? 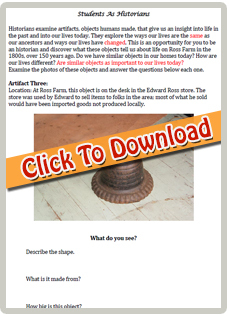 These documents allow students to examine photos of objects and answer the questions provided as a fun learning activity.